-Fantastic Greek Black Metal in the old school vein recalling old Rotting Christ, Varathron and Necromantia. -A masterpiece of occult Black Metal with 70's Rock and Heavy Metal influences. -Compilation featuring old and new material. -Two underground Black Metal band from Finland. -Bestial Black/Death Metal from Greece, expect no keyboards or female vocals. -Excellent Pagan Black Metal in the vein of Absurd. -Click on item to see a picture. -North American Black Metal hate. -Back in stock! A mandatory atmospheric Black Metal album in the vein of the old scandivian classics, an essential release. -Sinister Ambient Dungeon music for dark souls. -Polish Black Metal war under the banner of Lower Silesian Stronghold. -Hateful Black Metal from Spain released by Ancient Order Promotion. -Heathen Black Metal from New Zealand. -Unreleased full length of 2008, Black/Death Metal for fans of early Gorgoroth and early Impaled Nazarene. -Back in stock! Black Metal from Iceland, released by Terratur Possessions. -Raw pagan black Metal from Greece featuring Darkthule member, highly recommended! -Debut demo of dark and raw Black Metal from Ukraine. -Fast blasting unholy Black Metal hailing nature. -Fifth full lenght album from this long running act of the true Polish Black Metal underground. -Back in stock! Twisted underground Black Metal in the vein of Woods of Infinity. -Fantastic split filled with hate darkness and agression from the mighty Dunkelheit from Hungary and the mighty Wacht from Switzerland. -Northern underground raw Black Metal in the Satanic Warmaster vein. -Majestic Black Metal atmospheres and haunted ambience, highly recommended! -True German Black Metal in the Odal vein. -French Canadian heathen Black Metal. -Ceremonial maelstrom of ominous electronics and dark ambient textures, an audial descent into ritualistic obscurity and misanthropy. -Sepulchral, brooding Black Ambient from one of the most enigmatic and spectral entities the genre has produced. -An aural descent into the underworld of unconscious and subconscious dimensions, released by Fall of Nature Records. -Three extended descents into jet-black drift, funereal chamber music. -Back in stock! A complete statement of stoic but shimmering melodic Black Metal with expressive vocals. -Raw, cold Black Metal from Germany and Finland. -Back in stock! Mandatory, one of the best Polish Black metal release of all time. Forever Plaged Records edition. -Mandatory, a timless classic of true Polsih Black Metal hatred. Forever Plaged Records edition. -Mandatory, one of Gravelend best opus. Forever Plaged Records edition. -Mandatory, this album is Graveland's tribute to the viking years of Bathory. Forever Plaged Records edition. -Originally released in 2002 on Vinland Winds Records and now issued on pro-cassette by Signal Rex. -Five tracks of true Finnish raw Black Metal. -Legendary demo of cold Norwegian Viking Metal recorded in 1994 and now reissued by Night Birds Records and Todestrieb Records. -1994 and 1995 demo on a single cassette, raw old school Polish Black Metal. -Pure and possessed thrashing Black Metal. -This long waaited split is finally unleashed on the day they say the slave was born, three are the himns of Lusitanian evilness coming from each band. -Portuguese Black Metal elite presents true hateful Black Metal, highly recommended! -Night Birds Records / Todestrieb Records version. -Featuring interviews with Dolentia, Malefices, Year of the Goat and more. -Featuring interviews with Asymmetry, Slægt, Tollund Men, Veneror and Wither. -Compilation of their two previously recorded works, on vinyl for the first time. -Second demo for this one man band, still raw yet melodic Black Metal. -Powerful drumming combines with melancholic melodies und muliple layered passages, influenced by neoclassical orchestrations and choirs, recommended! -Raw, fast and furious Black Metal from Norway in the vein of the old tradition. -Polish Neo-Classical, a very great album. -Mandatory old school Polish Black Metal with an Industrial edge, both demos remastered on a single CD. -Trance inducing Black Metal from this Swedish one-man band, only two 20 minute songs filled with slow atmospheric riffs. -Re-release of the tape previously also released on Antihumanism but this with original mix of the recording wich was intended for vinyl release. -Split album of leading Polish underground Black Metal hordes. -Split release between these two bands hailing from NJ and NY, featuring new material of raw Black Metal in distinctly different styles. -Heathen Black Metal from Russia. -Black Metal on Frenteuropa Records. -Raw and primitive Black Metal in the vein of Ildjarn, highly recommended! -Compilation tape featuring the Kazikli Voyvoda EP and the Septic Teachings From Blackened Tongues demo. -True Black Metal from France featuring a Veles and a Graveland cover. -Fifth album of one of the best and oldest Canadian Black Metal horde, highly recommended! -The debut album from Englands Pale Mist, fourty-five minutes of pure hate, pain and torment dragging you even deeper into the pitch black abyss of chaos and darkness. -Eisenwinter and Totale Vernichtung collaborates to create Rostorchester, highly recommemded! -Fourth album of this Iberic Black Metal band. -Slavonic Pagan Black Metal with sorrowful poetry and mysterious atmosphere from Vyritsa, Russia. -Danish Black Metal project from Copenhagen that managed to compose incredible songs of Black Metal magic, highly recommended! -Nice looking magazine featuring interviews with Anguish, Cruciamentum, Gevurah, Ominous Silence Records, The Nihilistic Front and Vulturine. -Amazing reissue of one of the pillars of the primitive Black Metal scene, a must to own. -Lo-fi, unsettling, and ultra grim. This immediately takes me back to the early nineties and the heyday of the Slaughter Productions cassette scene. -Pitch black and malevolent, noise drenched occult Black Metal. -A seething quasi-ambient nightmare that lingers with the listener, enhanced in it's creep factor by the unsettling paintings from Sutcliffe Jugend's Kevin Tomkins that make up the album art. -One of the early Black Metal album from Quebec from 1996, atmospheric Black Metal in the vein of early Cradle of Filth. 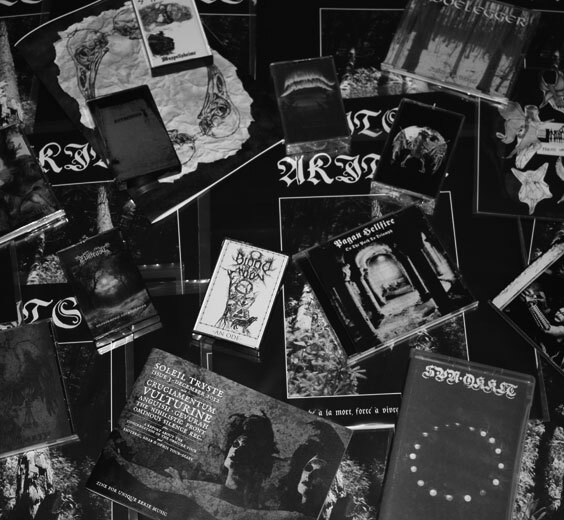 -Unique and radical Black Metal. -Recorded in Spring 2009, this EP makes use of the classic Trist style, but evokes a different emotion than many of his other works. -Trist's cut is titled "Nostalgie" III and is the final song from the Nostalgie sessions while Nuit Noire comes full force with two tracks of faerie worshiping Black Punk like only they can do. -Atmospheric Black Metal filled with harsh and freezing hatred. -Debut full-length from the Chicago disciples of Celtic Frost riffs and a more modern Black Metal edge, originally released by the mighty Head not Found. -Classic 1997 EP originally released by Necropolis Records reissued with bonus tracks. -Cult unholy Thrash Metal, second album originally released in 1999. -German Black Metal under the wings of Thor's Hammer Productions. -Cold, atmospheric and melancholic Black Metal. -A compilation featuring nearly 70 minutes of Black Metal from hordes like Death Fortress, Sylvus, Gevurah, Axis of Light, Tardigrada and more. -Dark ethereal Metal band from Nidaros, Norway. -Raw, epic Black Metal with a symphonic touch. -Epic and raw Norwegian Black Metal. -This two man Band from Greece plays traditional raw Black Metal inthe vein of the early nineties. -Famous Polish pagan Ambient project, majestic sounds anthems of Pride to their Fatherland. -Slavonic Ambient, originally recorded in Beat Studio in Kharkiv, Ukraine back in August 2000. -Great folkloric Ambient from this mighty Polish porject that should need no introduction.